After several years of research, Chris King began making his headsets available to the public. That was over ten years ago. His headsets incorporate the highest level of craftsmanship and performance in a segment of bicycle parts that had been seriously overlooked. The fork race is made of stainless steel to resist corrosion and machined to make a perfect seat for the bearing. The race is cut and polished to receive the inner dimension of a sealed bearing cartridge. The upper and lower bearing cups are machined aluminum then turned to tight tolerances that fit snugly and squarely into the head tube. 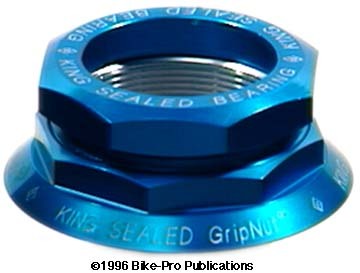 There is an upper adjusting nut, which would be called an upper cone race in a traditional ball bearing headset, and head lock nut. Both the adjusting nut and the head lock nut begin as machined aluminum pieces. They are then turned and machined, to create the threads for the steerer tube as well as precisely squared surfaces for installation tools. All the alloy pieces are machined from 7075- T651 aluminum, then anodized. 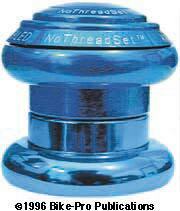 For the bearings, both cups have stainless steel precision sealed bearing cartridges pressed into them. 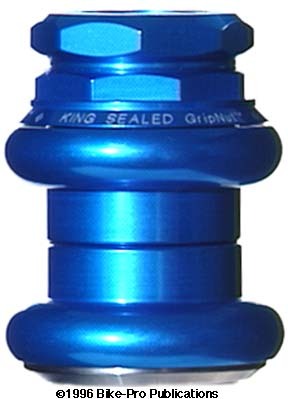 King Cycles makes these bearings so they will handle the horizontal load on what is traditionally a vertically loaded bearing. They are well shielded from moisture using a metal seal, (not rubber or nylon) and should provide years of life, if not the permanent solution to anyone's headset problems. They come in three stack height sizes, Standard European 43.5mm, a Short Stack Japanese 34.0mm, and a BMX size that is also used for pre- '91 Yeti framesets. The 1" Short Stack headset weighs 109 grams. All Chris King headsets are available in Blue, Black, Red, Silver or 3DV (Violet/Lavender). The King crown race is machined of stainless steel to such tight tolerances that careless removal somtimes damages it beyond reuse. 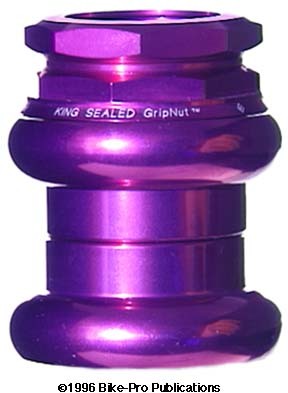 Not avaialble for review at time of writing, the Grip-Nut replaces the headlock nut and upper bearing cone of any of the King htreaded headset. The Grip-Lock comes in all three diameteres and all 5 colors. Chris King again presents his relentless standard of quality in this headset. The fork race is made of machined stainless steel, so it won't corrode, with a tapered polished surface that joins smoothly with the sealed bearing cartridge pressed into the lower bearing cup. The upper and lower cup are exactly the same, both made of machined 7075-T651 aluminum with a very highly polished, reflective surface. The upper cone race has no threads, is made of machined and polished aluminum, and has a beveled lower surface to fit securely into the sealed bearing cartridge. 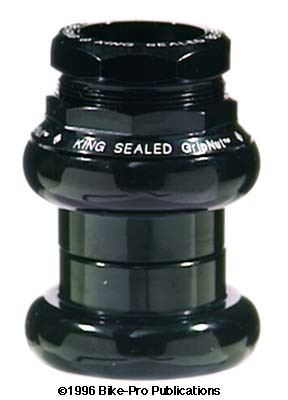 Remember, King makes their own sealed cartridge bearing so the loads are carried properly. The interior of this piece has a beveled surface, wide at the top, narrow at the bottom and is milled with a channel around the inner circumference for a rubber O-ring which seals the surfaces of the outer steerer tube and the inner headset. A finely machined aluminum cap piece, with a recess for the bolt head that draws up the SFN nut, (which many machinists will recognize as a square or round metal tubing connector). It also has a lip which seats and closes off the beveled upper cup set. The cap, nut and bolt which comprise the "SFN plug" has a 6mm by 1mm thread pitch steel bolt that is 30mm long with a 7.5 gram weight. 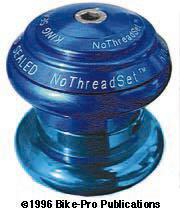 A threaded steel nut that has two star washer gripping pieces preened in place is threaded onto the bolt. When the SFN plug is pressed down firmly, it pre-loads the weight on the bearings for final adjustment. Then the stem is cinched to the steerer tube, holding all the headset pieces securely in place on the fork tube. 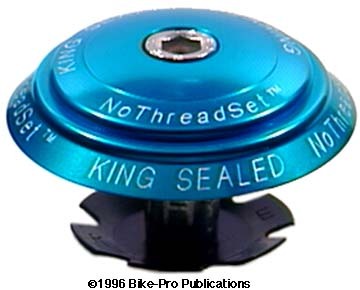 The King NoThreadSetª is made in 1", 1 1/8", and 1 1/4" in Blue, Black Lavender, Red or Silver. 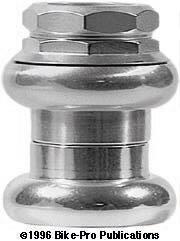 The 1 1/4" diameter weighs 150 grams, of which 35 grams is the SFN plug. Made in USA. This Conversion Kit will change out the threaded parts in a King threaded headset to make it a NoThreadSetª. It includes the top cap piece, compression parts SFN, cinching bolt, and cone race piece. The Conversion Kit must be ordered in the same size as the original headset, and the threadless fork must also be the same original diameter. The Conversion Kit is made in all three sizes in 5 colors.